Dr. Gayatri Chakravorty Spivak, University Professor at Columbia and major figure in literary studies, visited Houston on 29-30 January, delivering her talk “Lessons from My Travels” to an audience of more than 400 people from UH, Rice, and the Houston community. 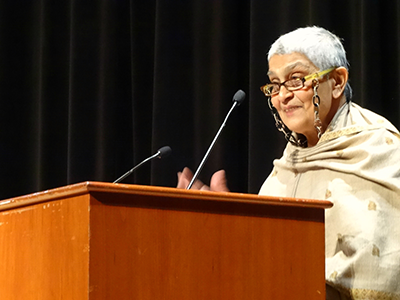 Spivak’s presentation blended humor, narratives about her own travel and teaching, and her philosophical work. As her talk focused on events in her life, she came back, again and again, to one point: literary study is necessary for ethical development. Literature requires us to use our imagination, and our imaginations are necessary for the slow cooking of the soul needed for social justice. Bringing Dr. Spivak to UH was a major event for not only the English Department but also the newly-emerged Empire Studies Collective, which was also active in bringing renowned Kenyan author and activist Ngugi wa Thiong’o to campus last semester. Special thanks for the events go to the UH Department of English; UH Women’s, Gender, and Sexuality Studies; the UH Department of Modern and Classical Languages; the El Paso Lecture Series; and the Rice University Center for the Study of Women, gender, and Sexuality.